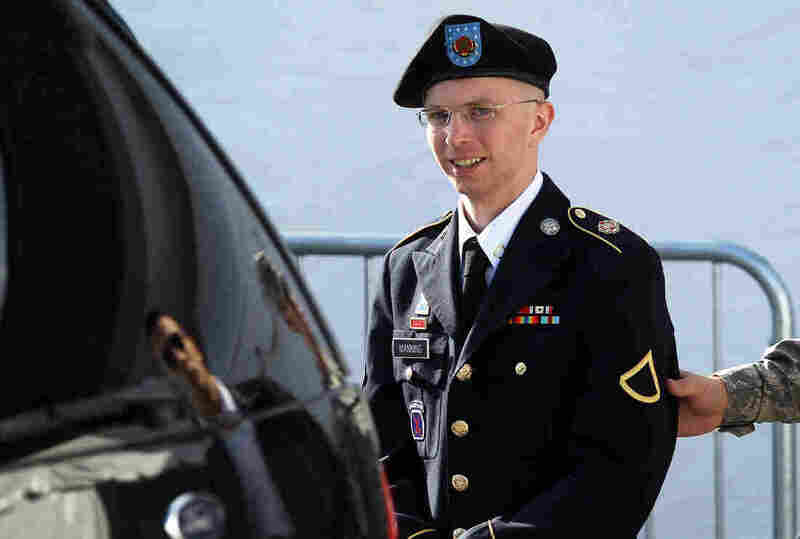 WikiLeaks Suspect Bradley Manning: 'I Thought I Was Going To Die In That Cage' : The Two-Way Manning, who has offered to plead guilty to lesser charges, is asking for case to be dismissed, because he says his pre-trial punishment was so severe. U.S. Army Private Bradley Manning is escorted as he leaves a military court in June. "He first discussed his arrest in Iraq and his transfer to Kuwait where he was held for a nearly two months before being transferred to the brig at Marine Base Quantico in Virginia in July 2010. "He said he once passed out due to the heat. He also said not being allowed to know what was happening to him or in the outside world was distressing. He contemplated suicide in Kuwait.
" 'My world just shrunk to Camp Arafjon, to that cage,' Manning said. 'I thought I was going to die in that cage.' "
Manning's detention was the subject of international scrutiny. As we reported in March, United Nations special rapporteur on torture found Manning's detention was "cruel and inhuman." And that's what Manning is trying to argue during this week's hearings at Fort Meade, Md. Manning wants the case against him to be dismissed because his pre-trial punishment was so severe. The AP reports that when Manning was moved to Quantico, he spent five months in solitary confinement. For 23 hours a day, he was constrained to a windowless 6-by-8-foot cell. Manning had previously described his confinement in an 11-page letter released by his civilian attorney, David Coombs. In the letter, he said for days, because he was under suicide watch, he was forced to sleep naked and without a blanket. "Coombs asked Manning whether he had any recollection of an incident on 30 June 2010, when he had lost control of himself to the extent that doctors had to intervene. 'He was screaming, babbling, banging his head against the cell,' said Coombs. "Manning replied: 'I knew I had just fallen apart, everything is foggy and hazy at that point.'" As we reported, Manning offered to plead guilty to minor charges in the case, but not to accusations that he was spying and aiding American enemies. The judge in the case approved those guilty pleas, today, but the U.S. government has not said whether it will move forward with the more serious charges. "The military contends the treatment was proper, given Manning's classification then as a maximum-security detainee who posed a risk of injury to himself or others. "Col. Denise Lind's ruling doesn't mean the pleas have been formally accepted. That could happen in December. "But Lind approved the language of the offenses to which Manning would admit. "She said those offenses carry a total maximum prison term of 16 years." "The material that Bradley Manning is alleged to have leaked has highlighted astonishing examples of U.S. subversion of the democratic process around the world, systematic evasion of accountability for atrocities and killings, and many other abuses."